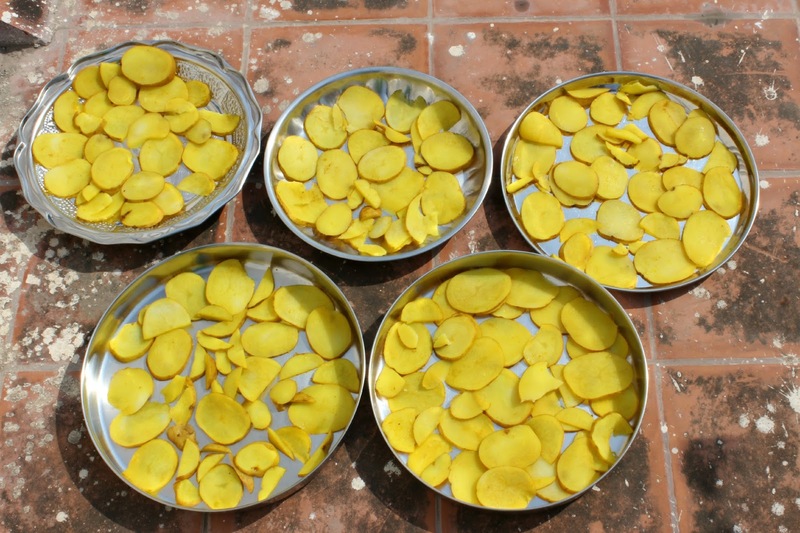 This patented potato vathal comes from my Grandmother Radha Bai’s family. If you see anyone using the name “potato vathal”, tell me. They can call it anything but potato vathal. Ok it’s not patented, not yet, but this potato vathal is part of family heirloom that is handed over to each generation along with diabetes, absentmindedness and craziness. I’ve got all of them except diabetes which I am on the path to. My mother miraculously remembers this potato vathal recipe not because she maintains my grandmother’s recipe notes neatly organized in grand old chests but because it was among the easiest things to make. You will not believe that a vathal can be so easy. Vathals are usually intimidating for first timers but this vathal is nothing like other vathals – there’s no grinding, no boiling, stirring, breaking lumps nothing. This is unlike any other vathal you’ve ever made. If you’re starting out, make this potato vathal. 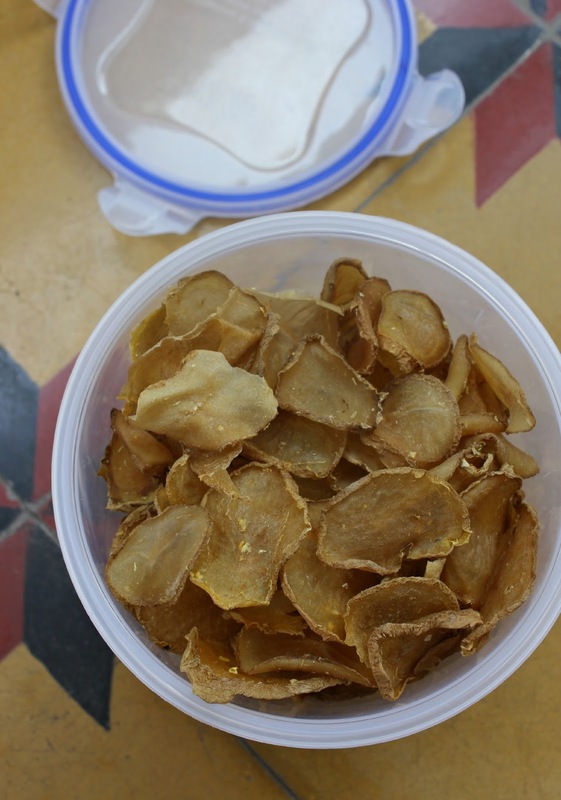 These potato vathals are thicker than your regular potato chips and they’re really tasty. They’re splendid to munch on while watching T.V. 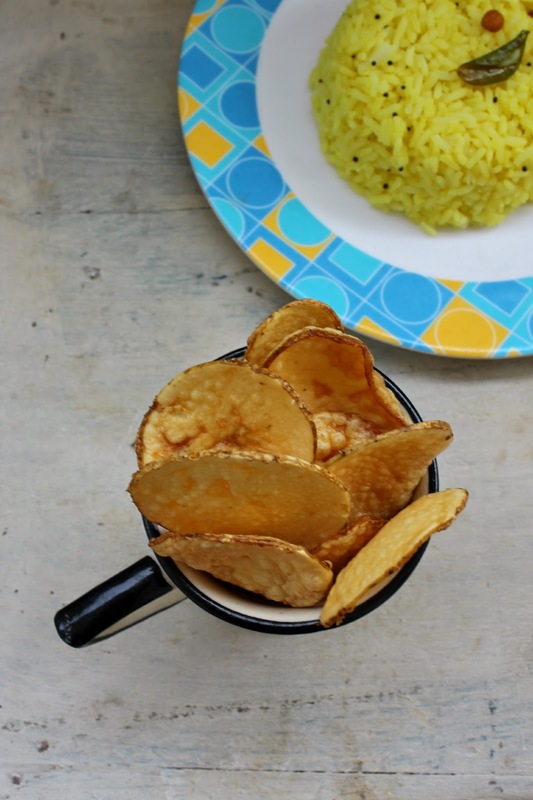 They make a great side with lemon rice or sambar rice too. 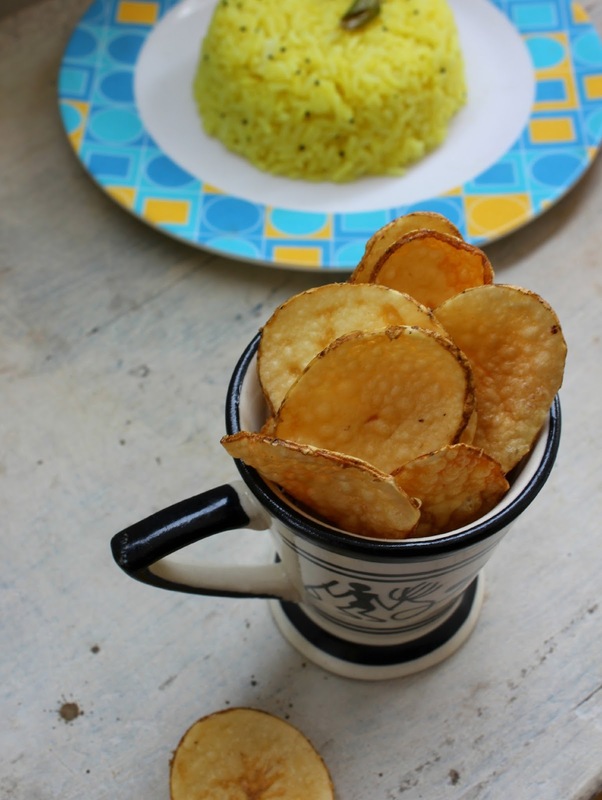 My mother manages to pass off boring tomato rice by packing them with these fried potato vathals. She did just that yesterday. These potato vathals are my all time favourite vathals next only to the onion vathals I made last summer. The onion vathals are magical. You must try them too though they involve a bit more effort than these potato vathals. Vathals can make great favors. They’re spoil proof and easy to pack and they add a nice homemade touch. 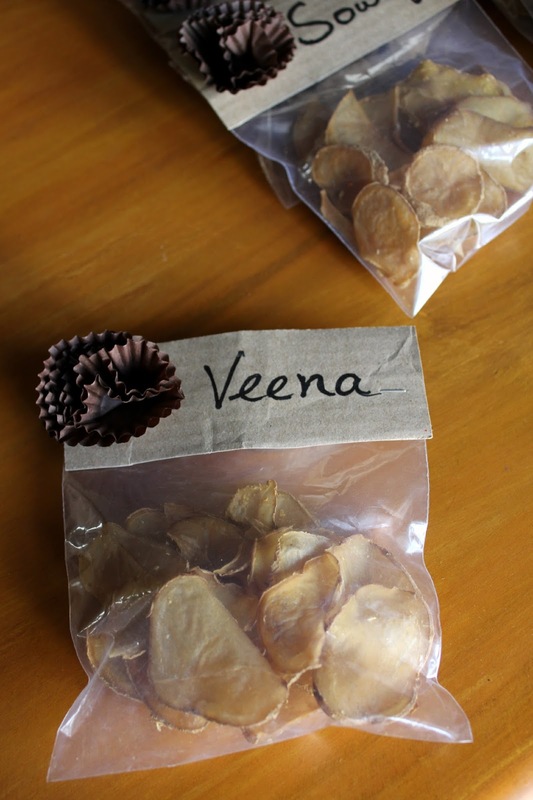 We had a small food blogger meet last weekend at my place and I packed my potato vathals for my blogger friends to take home. The first thing to do when you decide to make vathals is to switch on the TV and watch the weather report. Ramanan may not be exact most times but is usually in the ballpark. If he says heavy rainfall tomorrow, there may be a light sprinkling the day after. More than anything else, you need scorching heat to make vathals. For that, Chennai is probably the best place in the world and now is just about perfect although my mother makes it throughout the year. Actually anyone anywhere can make vathals as long as you have a lot of heat. It has been blistering hot the past couple of weeks here. You might as well make vathals when the sun scorches. 1. Wash potatoes well. Slice them into thin rounds. These need not be very fine like potato chips. These are usually done a little thicker. I used a regular knife to slice them. You could use a mandolin if you have one but that’s not necessary. 2. 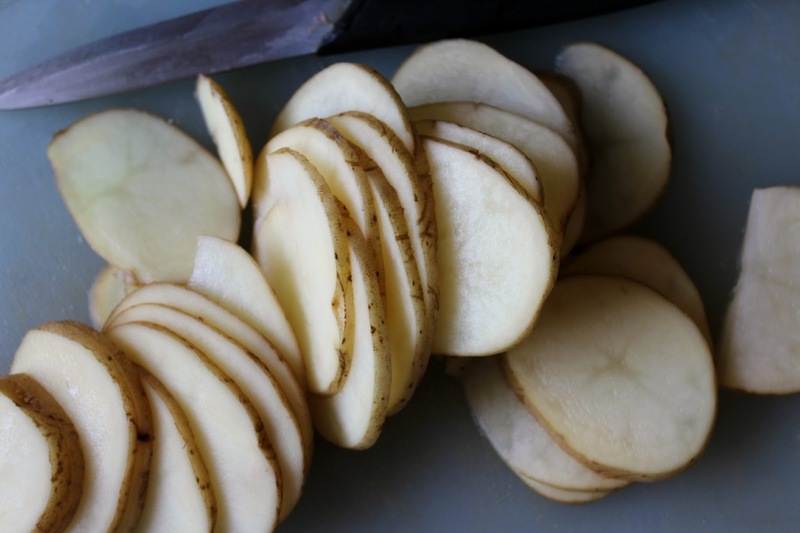 Dump the sliced potatoes in a large bowl of water and rinse again. 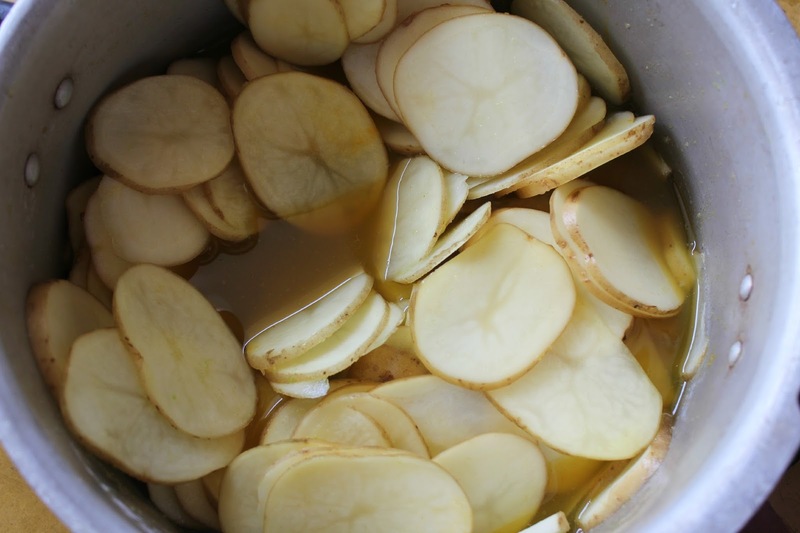 Drain the water and transfer the sliced potatoes to a pressure cooker. 3. 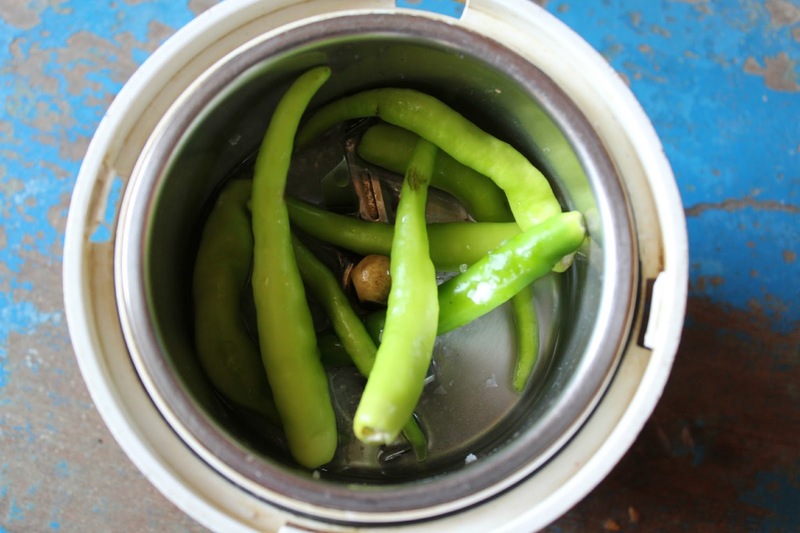 Grind together green chillies and salt to a fine paste. 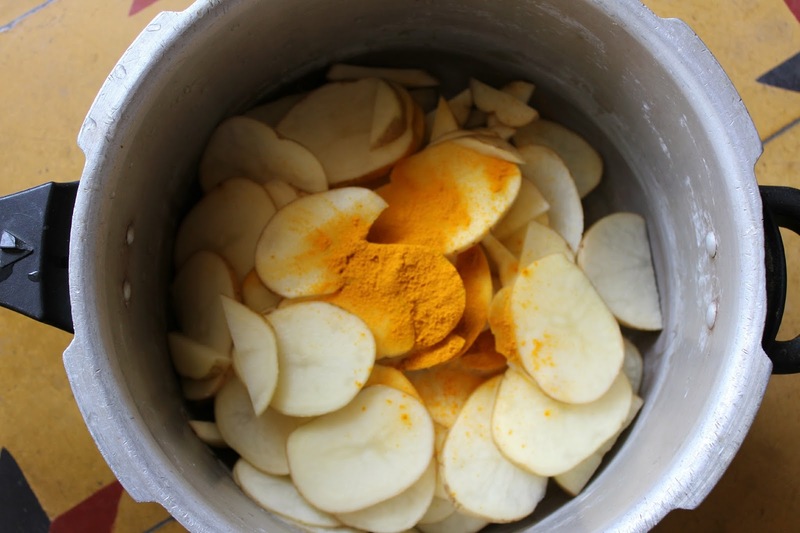 Add this paste to the sliced potatoes along with turmeric powder and just enough water to submerge the potatoes. 4. Close the pressure cooker lid and cook on high heat for 10 minutes. Do not plug in the weight. Switch off after 10 minutes, plug in the weight and let sit for 10 minutes. 5. Remove weight, open the pressure cooker lid, drain the liquid and arrange the potatoes in a single layer on plates or a clean cotton dhoti or saree. Dry in direct scorching sunlight for 2-3 days or till the vathal turns brittle. Mind you, you’ll have to retrieve them at sundown and place indoors and then again place them out the next morning. As they dry they’ll shrink in volume. What seemed like 5 platesof vathals will now be reduced to 1 plate. This is to be expected. 6. Once completely dry store in airtight jars. 7. To fry the vathals, heat oil in a wok and when hot slide in the vathals a few at a time. Make sure the oil is really hot. They’ll unfurl quickly and brown quickly too. Remove using a slotted karandi to absorbent paper. Let cool slightly. Serve alongside rice or as a snack. While you’re on vathals do check out my onion vathals. Everybody loves them. This entry was posted in Podi, Vathal & Pickle and tagged aloo vathal, chutney, easy vathal, potato vadam, potato vathal, recipe, summer vathals, urulaikizhangu vathal, vadam, vathal. sure. Let me know how they turn out.